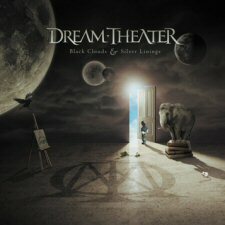 Maintaining their consistent average of a new album every two years, long running New York (U.S.) based progressive metal act Dream Theater are back with their tenth full-length effort Black Clouds & Silver Linings, the long awaited follow up to 2007’s generally well received Systematic Chaos. Given that Dream Theater generally opts for a different direction with each new release; I was interested to see what the band would come up with on their new album. And while the band aren’t breaking any real new ground throughout Black Clouds & Silver Linings, Dream Theater’s latest release is yet another consistent and strong album for the five piece act. A Nightmare to Remember, which is based around a car accident guitar John Petrucci was involved in as a child, is certainly one of the heaviest numbers on the album, and gets the album off to a positive start. Mike Portnoy’s relentless double kick drum work throughout the song certainly lends weight to the aggressive nature of the tune; while Petrucci’s weighty riffs/shredding solo efforts are nicely counterbalanced with Jordan Rudess’ atmospheric keyboard fills and solos. The only real flaw within the sixteen minute track is on the vocal front. While James LaBrie usually bares the brunt of criticism, its Portnoy’s cheesy attempt at death growls that otherwise mar what is a great Dream Theater opener. The first single/promotional video A Rite of Passage (lyrically based on the secret society of Freemasonry) is easily the most straight forward and accessible track on the album with its simplistic and ever present guitar/bass riffs and catchy chorus, while the slower ballad-like Wither (based around Petrucci’s fear of writers block), which could have easily slotted onto 1997’s Falling Into Infinity with its laid back feel, offers a short break around the halfway mark. There’s an obvious sense of familiarity surrounding The Shattered Fortress, as it concludes Portnoy’s twelve-step Alcoholics Anonymous suite, which began with The Glass Prison on 2002’s Six Degrees Of Inner Turbulence. With a lot of the melodies and riff structures lifted from the previous four efforts, the song does have a bit of a ‘heard it all before’ feel to it, but thankfully there’s a couple of new ideas thrown in to stop it from sounding like a complete rehash of old ideas and sounds. Portnoy pays tribute to his late father Howard in The Best of Times, which is for the most part a ballad, but does boast some heavier moments, revealing a definite Rush influence (in particular 1980’s The Spirit of Radio). But what really stands out on this track is Petrucci’s solo work in the last three minutes. Petrucci has always been known as a skilled player, but his performance here is both emotive and heartfelt, and quite possibly his strongest performance ever. Finishing up the album is the near twenty minute epic The Count of Tuscany, which not unlike the title track on Octavarium (2005), is made up of many different movements with varying tempos, all within the one track. The flow from the hard and aggressive sections to the more ambient moments are done quite smoothly, with Petrucci’s echoed solo toward the latter half and the triumphant ending the real stand out moments. For diehard Dream Theater fans, Black Clouds & Silver Linings also comes in a deluxe three disc edition, which in all honesty is only worthy if you’re an absolute fan. The second disc (Entitled Uncovered 2008/2009) is perhaps the best of the two bonus discs, with the disc boasting six cover songs. For the most part, the covers work really well, with the choices from Rainbow (Stargazer), Dixie Dregs (Odyssey), Zebra (Take Your Fingers From My Hair) and King Crimson (Larks’ Tongues In Aspic Pt. 2) sounding custom built for a Dream Theater makeover. But not all of the covers work, with the Queen medley (Tenement Funster/Flick of the Wrist/Lily of the Valley) and the Iron Maiden effort (To Tame a Land) falling short in the lead vocal department. The final disc is an instrumental version of Black Clouds & Silver Linings, albeit with the solos removed. Although kind of interesting, it’s a little pointless to the casual fan with its appeal limited purely to Dream Theater collectors and musicians exclusively. As is the case with most of the band’s previous releases, Black Clouds & Silver Linings takes a while to truly absorb and take in, especially when only two of the six tracks run under the twelve minute mark. But after allowing the album to sink in, Black Clouds & Silver Linings easily overshadows some of Dream Theater’s more recent work, and quite possibly their strongest release since 2003’s Train of Thought.